Reginald Sealey (left) and Erica Fray of Stamford, Conn. got married at the Darien Historical Society in Darien, Conn. on Nov. 30, 2017. 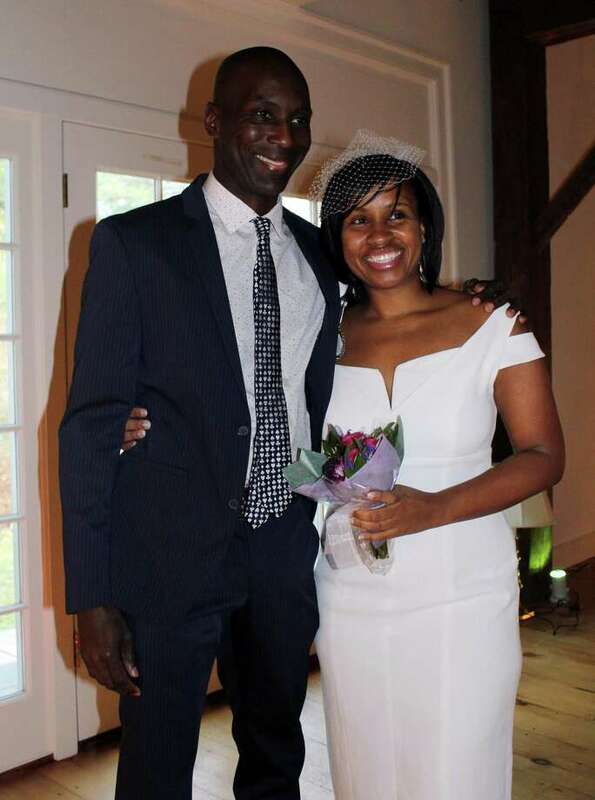 Erica Fray and Reginald Sealey of Stamford headed to the Darien Historical Society instead. The couple, who has been together 19 years, had a ceremony planned in Jamaica, but at the last minute decided they wanted a small, intimate ceremony for family and friends who couldn’t make the trip. Fray, 39, and Sealey, 42, are familiar with the area because they both work out at Equinox in Darien, but didn’t know about the historical society until they saw photos of it online. Fray said she was drawn to the feel of the place with its broad, wooden board floors and barn area usually used for exhibits. The couple was married by local justice of the peace Enid Oresman. Oresman has been serving as a justice of the peace in town for 20 years and is also a former Darien Historical Society president. To book an event at the Darien Historical Society, contact Ulla Kremer at (203) 655-9233 or ukremer@darienhistorical.org. Library: The open floor plan of the library makes it ideally suited for cocktails or dinner alike. Barn: Soaring post and beam structure dating from the 19th century creates a charming atmosphere for your next event - with full 21st century A/V infrastructure. Gardens: The award-winning garden is a perfect setting for pre-event cocktails and photographs. The pair was married in front of six family members and friends, including the bride’s best friend who introduced the couple. They celebrated afterward with cupcakes and champagne. “We wanted something small and intimate,” Fray said. Maggie McIntire, executive director of the historical society, said this is the first wedding the Historical Society has hosted in several years. McIntire said the historical society rental price for wedding depends on the day and number of guests. The barn area is only available for rental pending on if it’s being used for an exhibit.